I admit that there is very little that inspires me to make the two hour drive up I-65 to Nashville these days. I have lived there twice and used to visit fairly regularly but eventually I felt like I had gotten all of the sugar out of the Nashville gum – or perhaps all of the Goo Goo out of the Nashville cluster. Now that I have finally sampled Chef Sean Brock’s food, I long to get back to Nashville soon to enjoy a meal at the Nashville version of his award-winning restaurant, Husk (www.huskrestaurant.com), which opened in Music City in 2013. 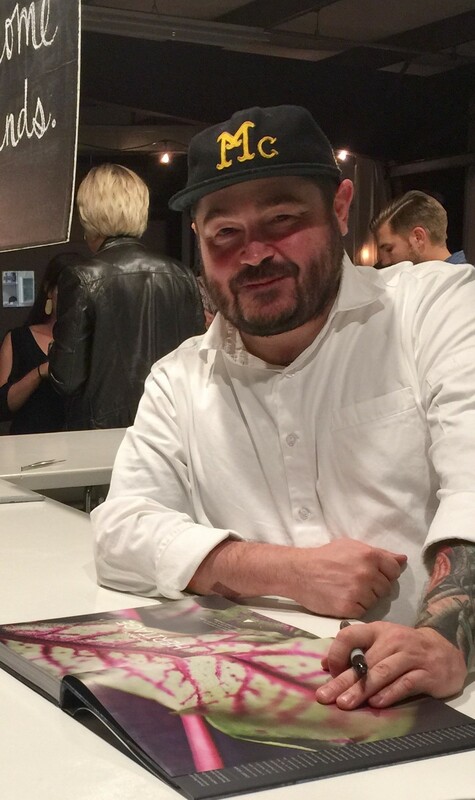 Sean Brock is the James Beard and multi-award winning chef most identified with the original Husk in Charleston. Heritage, Brock’s 2014 cookbook, is one of the most beautiful and certainly most readable cookbooks ever. Brock challenges himself to only use Southern indigenous ingredients in his restaurants – often from his own garden and herd of pigs – and the results are creative and special. “If it ain’t Southern, it ain’t walkin’ in the door” is my favorite Sean Brock quote. Heritage contains a recipe for “cornbread and buttermilk soup” that I will be making forever. It was inspired by the chef’s early habit of crumbling cornbread into a cup of buttermilk — a meal my Granddaddy Harbison ate regularly. Sean Brock is humble and authentic. I finally had my first Sean Brock meal at the Alabama Chanin Factory in Florence last Saturday evening when my friend Anne and I travelled over for the most recent Friends of the Café dinner. We got off to a bad start at the Factory when someone in the Alabama Chanin organization had misplaced our reservation and a staffer was a little rude to us before they found their mistake. It’s the first time I was ever made to feel uncomfortable at a Factory event and the lack of grace with which the situation was handled tainted the good feelings about the Factory that I have written about so many times in the past. That early unpleasantness faded quickly, however, when Sean Brock’s food made its first appearance and a series of passed hors d’oeuvres circulated among assembling diners. Jimmy Red Johnny Cakes with pimento cheese, grilled oysters on the half shell with ‘nduja sausage and lovage, and beef tartare lettuce wraps were carried around accompanied by the first of the pairings from Grassroots Wine, a stalwart of the Southern Foodways Alliance. Southern Foodways Alliance was once again one of the beneficiaries of the dinner’s proceeds. A last minute decision was made to share those proceeds with victims of Hurricane Matthew which was bearing down on Sean Brock’s beloved Charleston as we gathered. When it was time to be seated, Anne and I were reunited with our friend, Barbara from Tulsa, who we met at the Adam Evans Factory dinner in August, and introduced to Barbara’s friends, Carol and Paul from Chicago, and to Cindy, a Florence local. A hallmark of the Factory dinners has always been the instant community that is formed. I quickly enlisted Jason at the table behind me to keep me posted on the Alabama-Arkansas score. 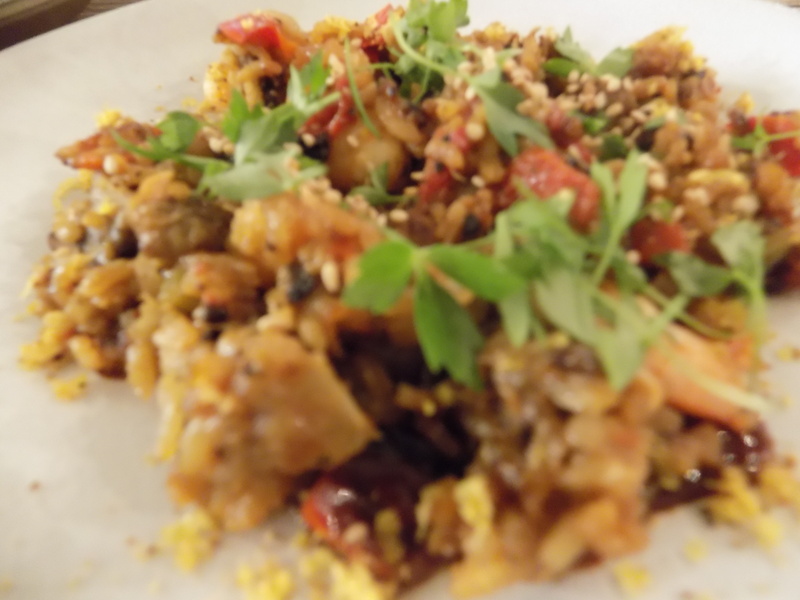 The second course, a savory and exceptional shrimp and eggplant purloo, brought together a number of Brock’s influences. Purloo, a South Carolina Lowcountry standard, is reminiscent of Gulf Coast jambalaya, which is itself closely related to Spanish paella. 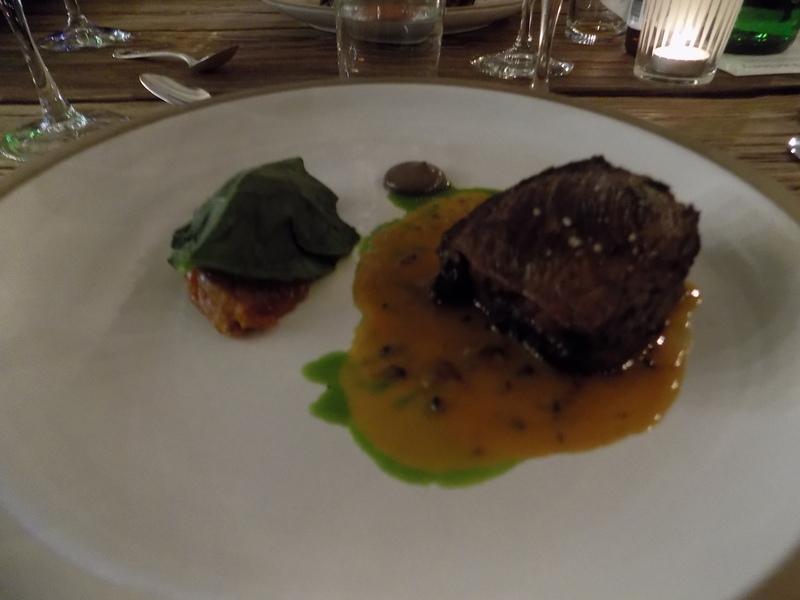 The third course was a perfectly grilled Denver steak with black truffle and sweet potato. The portions, the flavors, and the aesthetic were perfection. Finally, a panna cotta made with Cruze Farm’s buttermilk, muscadines, and brown butter completed, once again, one of the very best meals I have ever tasted. Several of those meals have been consumed in Florence, Alabama. I have regularly written about the magic and community that make the regular pilgrimages to the Florence Friends of the Café meals so special. Like an author with his books, it’s hard to choose a favorite among the Factory meals – it always seems like the most recent is my favorite. Either way, Sean Brock is now one of my very favorite chefs. 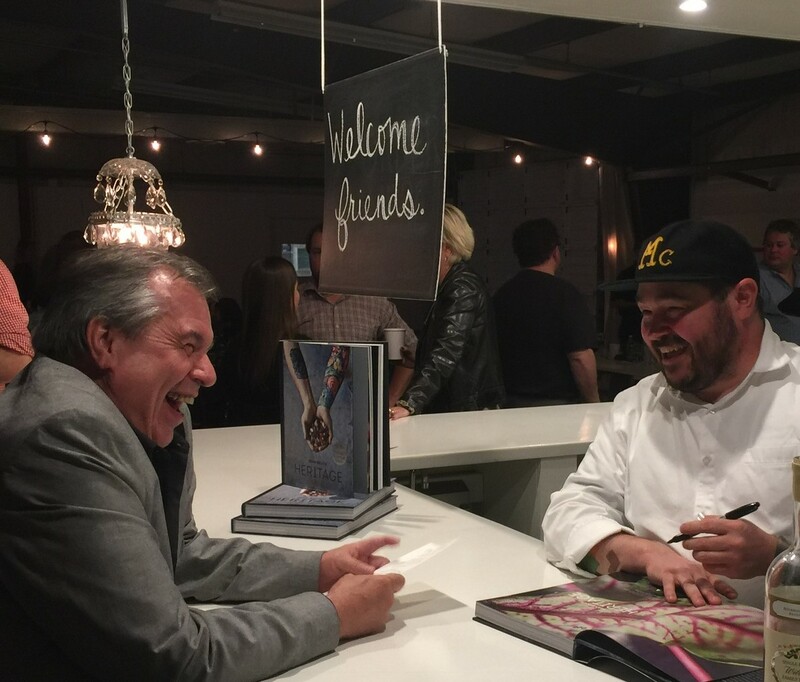 He signed cookbooks after the event and his courtesy and patience, his eagerness to talk about his food and how honored he was to be serving us, his pride and his passion for locally grown and sourced food – were infectious and inspiring. He is also the source of my favorite anecdote about Birmingham chef Frank Stitt. This was the final 2016 dinner for the Factory series. May 2017’s line-up be equally inspired. And may Sean Brock keep exploring and teaching what Southern food really means. This entry was posted in Chef Sean Brock and tagged Alabama Chanin Factory, Charleston Husk, Chef Sean Brock, Cruze Farms, Florence Alabama, Friends of the Cafe dinners, Nashville Husk, Sean Brock's Heritage cookbook, Southern Foodways Alliance on October 11, 2016 by gedwardjourney.